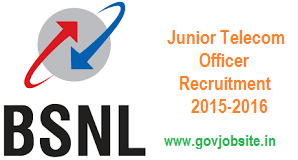 Bharath Sanchar Nigam Private Ltd (BSNL) has release JTO recruitment notification for 2015. Bharath Sanchar Nigam Private Ltd (BSNL) has recently release the notification for the posts of Junior Telecom Officer (JTO). The candidates who are interested in Bharath Sanchar Nigam Private Ltd (BSNL) they can apply for Bharath Sanchar Nigam Private Ltd (BSNL) recruitment. And who are waiting for this opportunity they get a good chance to apply for Bharath Sanchar Nigam Private Ltd (BSNL) recruitment. Bharath Sanchar Nigam Private Ltd (BSNL) should release the posts as per the requirement notification. In case of JTO(c) ,the candidate must have the Bachelor’s of Engineering /Bachelor of technology or equivalent in Civil Engineering from any recognized university/Institute. In case of JTC(T), In case of JTO(c) ,the candidate must have the Bachelor’s of Engineering /Bachelor of technology or equivalent in Civil Engineering from any recognized university/Institute in any of the following displines(Telecommunication/Electronics/radio/Computer/Electrical/Information technology. The candidate should possess the M.Sc(Electronics)/m.Sc(Computer Science) from recognized university in recognized university. For Telecom Officer Posts the Selection process will base on online test and interview. Mode of apply: You can apply online mode for Telecom Officer Posts. Application Fee: You have to pay Rs.750/- as online mode i.e. through net Banking/Credit/Debit cards/. How to apply: The candidates who are interested in the Telecom Officer Posts, they can go for official website of BSNL and apply. Pay Scale: Rs.16, 400/- -Rs.40, 500/-.